Traditionally this damson pickle is made with whole damsons but we prefer it this way with halved damsons. 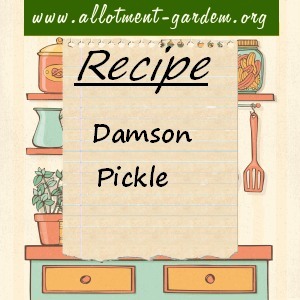 If you do use whole damsons they should be pricked before cooking to stop them shrivelling up and drying out. Just remember that stone when you come to eat it! Peel, half and stone the damsons. Tie the cloves, allspice, cinnamon, ginger and lemon rind in a muslin bag. 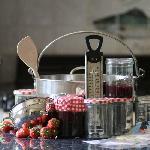 Put the sugar and vinegar into a large stainless steel or enamelled pan and heat until the sugar has dissolved. Bring the syrup to the boil, add the damsons and bag of spices. Simmer for about 5 minutes or until the damsons are just soft. 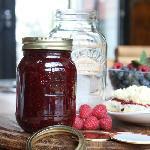 Remove the damsons using a slotted spoon and pack them into clean, hot, sterilized jars. Boil the syrup until it has reduced by about one third. Discard the bag of spices and pour the syrup over the damsons, allowing the syrup to penetrate through. If necessary add more syrup until the jars are full. Label with contents and date once the jars are fully cool. Makes around 5 lb (2.3 kg). Note: Bottle any remaining syrup as the damsons may need topping up during storage. Damson pickle, kept in properly sterilized and sealed jars, should keep for a year in a cool dark place. 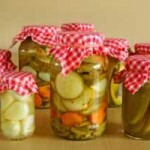 Once opened, keep in the fridge and try to use within 4 weeks. My Dad, who is now 88, tells a story when he was a young boy in grade school—a classmate was eating something, and Dad asked what she had, and with her mouth full, she replied, “Paair Pikcos”. So I wanted to make him some! Hope he’ll enjoy it when it’s ready. Thanks.